This article is about the city. For the county (Kauno apskritis), see Kaunas County. Kaunas (/ˈkaʊnəs/; Lithuanian: [ˈkɐʊˑnɐs] ( listen); also see other names ) is the second-largest city in Lithuania and the historical centre of Lithuanian economic, academic, and cultural life. Kaunas was the biggest city and the centre of a county in Trakai Municipality of the Grand Duchy of Lithuania since 1413. 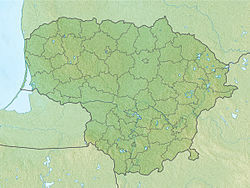 In the Russian Empire, it was the capital of the Kaunas Governorate from 1843 to 1915. During the interwar period, it served as the temporary capital of Lithuania, when Vilnius was seized by Poland between 1920 and 1939. During that period Kaunas was celebrated for its rich cultural and academic life, fashion, construction of countless Art Deco and Lithuanian National Romanticism architectural-style buildings as well as popular furniture, the interior design of the time, and a widespread café culture. The city interwar architecture is regarded as among the finest examples of European Art Deco and has received the European Heritage Label. It contributed to Kaunas being named as the first city in Central and Eastern Europe to be designated as a UNESCO City of Design. Kaunas has been selected as the European Capital of Culture for 2022, together with Esch-sur-Alzette, Luxembourg. The city is the capital of Kaunas County, and the seat of the Kaunas city municipality and the Kaunas District Municipality. It is also the seat of the Roman Catholic Archdiocese of Kaunas. Kaunas is located at the confluence of the two largest Lithuanian rivers, the Nemunas and the Neris, and is near the Kaunas Reservoir, the largest body of water in the whole of Lithuania. The city's name is of Lithuanian origin and most likely derives from a personal name. Before Lithuania regained independence, the city was generally known in English as Kovno, the traditional Slavicized form of its name; the Polish name is Kowno; the Belarusian name is Koўна, Kowna. An earlier Russian name was Ковно Kovno, although Каунас Kaunas has been used since 1940. The Yiddish name is קאָװנע Kovne, and the names in German include Kaunas and Kauen. The city and its elderates also have names in other languages (see Names of Kaunas in other languages and names of Kaunas elderates in other languages). An old legend claims that Kaunas was established by the Romans in ancient times. These Romans were supposedly led by a patrician named Palemon, who had three sons: Barcus, Kunas and Sperus. Palemon fled from Rome because he feared the mad Emperor Nero. Palemon, his sons and other relatives travelled to Lithuania. After Palemon's death, his sons divided his land. Kunas got the land where Kaunas now stands. He built a fortress near the confluence of the Nemunas and Neris rivers, and the city that grew up there was named after him. A suburban region in the vicinity is named "Palemonas". On 30 June 1993, the historical coat of arms of Kaunas city was re-established by a special presidential decree. The coat of arms features a white aurochs with a golden cross between its horns, set against a deep red background. The aurochs was the original heraldic symbol of the city, established in 1400. The heraldic seal of Kaunas, introduced in the early 15th century during the reign of Grand Duke Vytautas, is the oldest city heraldic seal known in the territory of the Grand Duchy of Lithuania. The current emblem was the result of much study and discussion on the part of the Lithuanian Heraldry Commission, and realized by the artist Raimondas Miknevičius. An auroch has replaced a wisent, which was depicted in the Soviet-era emblem that was used since 1969. Kaunas also has a greater coat of arms, which is mainly used for purposes of Kaunas city representation. The sailor, three golden balls, and Latin text "Diligite justitiam qui judicatis terram" (English: Cherish justice, you who judge the earth) in the greater coat of arms refers to Saint Nicholas, patron saint of merchants and seafarers, who was regarded as a heavenly guardian of Kaunas by Queen Bona Sforza. According to the archeological excavations, the richest collections of ceramics and other artifacts found at the confluence of the Nemunas and the Neris rivers are from the second and first millennium BC. During that time, people settled in some territories of the present Kaunas: the confluence of the two longest rivers of Lithuania area, Eiguliai, Lampėdžiai, Linkuva, Kaniūkai, Marvelė, Pajiesys, Romainiai, Petrašiūnai, Sargėnai, and Veršvai sites. A settlement had been established on the site of the current Kaunas old town, at the confluence of two large rivers, at least by the 10th century AD. Kaunas is first mentioned in written sources in 1361 when the brick Kaunas Castle was constructed. In 1362, the castle was captured after a siege and destroyed by the Teutonic Order. Commander Vaidotas of the Kaunas castle garrison, with 36 men, tried to break through, but was taken prisoner. It was one of the largest and important military victories of the Teutonic Knights in the 14th century against Lithuania. The Kaunas castle was rebuilt at the beginning of the 15th century. In 1408, the town was granted Magdeburg rights by Vytautas the Great and became a centre of Kaunas Powiat in Trakai Voivodeship in 1413. Vytautas ceded Kaunas the right to own the scales used for weighing the goods brought to the city or packed on site, wax processing, and woolen cloth-trimming facilities. The power of the self-governing Kaunas was shared by three interrelated major institutions: vaitas (the Mayor), the Magistrate (12 lay judges and 4 burgomasters), and the so-called Benchers' Court (12 persons). Kaunas began to gain prominence, since it was at an intersection of trade routes and a river port. In 1441 Kaunas joined the Hanseatic League, and Hansa merchant office Kontor was opened—the only one in the Grand Duchy of Lithuania. By the 16th century, Kaunas also had a public school and a hospital and was one of the best-formed towns in the whole country. In 1665, the Russian army attacked the city several times, and in 1701 the city was occupied by the Swedish Army. The Black Death struck the area in 1657 and 1708, killing many residents. Fires destroyed parts of the city in 1731 and 1732. After the final partition of the Polish–Lithuanian state in 1795, the city was taken over by the Russian Empire and became a part of Vilna Governorate. During the French invasion of Russia in 1812, the Grand Army of Napoleon passed through Kaunas twice, devastating the city both times. A hill fort mound in Kaunas is named Napoleon's Hill. To prevent possible easy access through the city and protect the western borders of Russia, the Kovno Fortress was built. It is still visible throughout the town. After the unsuccessful January Uprising against the Russian Empire, tsarist authority moved the Catholic Seminary of Varniai, prominent bishop Motiejus Valančius and Samogitian diocese institutions to Kaunas, where they were given the former Bernardine Monastery Palace and St. George the Martyr Church. Only selected noblemen were permitted to study in the Seminary, with the only exception being peasant son Antanas Baranauskas, who illegally received the nobleman documents from Karolina Praniauskaitė. He began lectures using the Lithuanian language, rather than Russian, and greatly influenced the spirit of the seminarians by narrating about the ancient Lithuania and especially its earthwork mounds. Later, many of the Seminary students were active in Lithuanian book smuggling; its chief main objective was to resist the Russification policy. Kaunas Spiritual Seminary finally became completely Lithuanian when in 1909 professor Jonas Mačiulis-Maironis became the rector of the Seminary, and replaced use of the Polish language for teaching with the Lithuanian language. Prior to the Second World War, Kaunas, like many cities in eastern Europe, had a significant Jewish population. According to the Russian census of 1897, Jews numbered 25,500, 35.3% of the total of 73,500. The population was recorded as 25.8% Russian, 22.7% Polish, 6.6% Lithuanian. They established numerous schools and synagogues, and were important for centuries to the culture and business of the city. After Vilnius was occupied by the Russian Bolsheviks in 1919, the Government of the Republic of Lithuania established its main base in Kaunas. Later, when the capital Vilnius was annexed by Poland, Kaunas became the temporary capital of Lithuania, a position it held until 28 October 1939, when the Red Army handed Vilnius over to Lithuania. The Constituent Assembly of Lithuania first met in Kaunas on 15 May 1920. It passed some important laws, particularly on land reform, on the national currency, and adopted a new constitution. The military coup d'état took place in Kaunas on 17 December 1926. It was largely organized by the military, especially general Povilas Plechavičius, and resulted in the replacement of the democratically elected Government and President Kazys Grinius with a conservative nationalist authoritarian Government led by Antanas Smetona. Shortly afterwards, tension between Antanas Smetona and Augustinas Voldemaras, supported by the Iron Wolf Association, arose seeking to gain authority. After an unsuccessful coup attempt in 1934, Augustinas Voldemaras was imprisoned for four years and received an amnesty on condition that he leave the country. During the interwar period, Kaunas was nicknamed as the Little Paris because of its rich cultural and academic life, fashion, Art Deco architecture, Lithuanian National Romanticism architectural style buildings as well as popular furniture, interior design of the time and widespread café culture. The temporary capital and the country itself also had a Western standard of living with sufficiently high salaries and low prices. At the time, qualified workers there were earning very similar real wages to workers in Germany, Italy, Switzerland and France, the country also had a surprisingly high natural increase in population of 9.7 and the industrial production of Lithuania increased by 160% from 1913 to 1940. Between the World Wars industry prospered in Kaunas; it was then the largest city in Lithuania. Under the direction of the mayor Jonas Vileišis (1921–1931) Kaunas grew rapidly and was extensively modernised. A water and waste water system, costing more than 15 million Lithuanian litas, was put in place, the city expanded from 18 to 40 square kilometres (6.9 to 15.4 sq mi), more than 2,500 buildings were built, plus three modern bridges over the Neris and Nemunas rivers. All the city's streets were paved, horse-drawn transportation was replaced with modern bus lines, new suburbs were planned and built (Žaliakalnis neighbourhood in particular), and new parks and squares were established. The foundations of a social security system were laid, three new schools were built, and new public libraries, including the Vincas Kudirka library, were established. J. Vileišis maintained many contacts in other European cities, and as a result Kaunas was an active participant in European urban life. The city also was a particularly important center for the Lithuanian Armed Forces. In January 1919 during the Lithuanian Wars of Independence, War School of Kaunas was established and started to train soldiers who were soon sent to the front to strengthen the fighting Lithuanian Army. Part of the Lithuanian armoured vehicles military unit was moved to Žaliakalnis, armed with advanced and brand new tanks, including the famous Renault FT, Vickers-Armstrong Model 1933 and Model 1936. In May 1919 Lithuanian Aircraft State Factory was founded in Freda to repair and to supply the army with military aircraft. It was considerably modernized by Antanas Gustaitis and started to build Lithuanian ANBO military aircraft. Due to the exceptional discipline and regularity the Lithuanian Air Force was an example for other military units. The ANBO 41 was far ahead of the most modern foreign reconnaissance aircraft of that time in structural features, and most importantly in speed and in rate of climb. At the time, Kaunas had a Jewish population of 35,000–40,000, about one-quarter of the city's total population. Jews made up much of the city's commercial, artisan, and professional sectors. Kaunas was a centre of Jewish learning, and the yeshiva in Slobodka (Vilijampolė) was one of Europe's most prestigious institutes of higher Jewish learning. Kaunas had a rich and varied Jewish culture. There were almost 100 Jewish organizations, 40 synagogues, many Yiddish schools, 4 Hebrew high schools, a Jewish hospital, and scores of Jewish-owned businesses. It was also an important Zionist centre. Initially prior to World War II, Lithuania declared neutrality. Although, on 7 October 1939 the Lithuanian delegation departed to Moscow where they later had to sign the Soviet–Lithuanian Mutual Assistance Treaty due to the unfavorable situation. The treaty resulted in five Soviet military bases with 20,000 troops established across Lithuania in exchange for the Lithuania's historical capital Vilnius. According to the Lithuanian Minister of National Defence Kazys Musteikis, Lithuanian Minister of Foreign Affairs Juozas Urbšys initially told that Lithuanians refuses Vilnius Region as well as the Russian garrisons, however then nervous Joseph Stalin replied that "No matter if you take Vilnius or not, the Russian garrisons will enter Lithuania anyway". He also informed Juozas Urbšys about the Soviet–German secret protocols and showed maps of the spheres of influence. Two of the military bases with thousands of Soviet soldiers were established close to Kaunas in Prienai and Gaižiūnai. Despite regaining the beloved historical capital, the Presidency and the Government remained in Kaunas. On 14 June 1940 just before midnight, the last meeting of the Lithuanian Government was held in Kaunas. During it, the ultimatum presented by the Soviet Union was debated. President Antanas Smetona categorically declined to accept most of the ultimatum demands, argued for military resistance and was supported by Kazys Musteikis, Konstantinas Šakenis, Kazimieras Jokantas, however the Commander of the Armed Forces Vincas Vitkauskas, Divisional general Stasys Raštikis, Kazys Bizauskas, Antanas Merkys and most of the Lithuanian Government members decided that it would be impossible, especially due to the previously stationed Soviet soldiers, and accepted the ultimatum. On that night before officially accepting the ultimatum, the Soviet forces executed Lithuanian border guard Aleksandras Barauskas [lt] near the Byelorussian SSR border. In the morning, the Lithuanian Government resigned while the president left the country to avoid the fate of the Soviet's puppet and hoping to form the Government in exile. Soon the Red Army flooded Lithuania through the Belarus–Lithuania border with more than 200,000 soldiers and took control of the most important cities, including Kaunas where the heads of state resided. The Lithuanian Armed Forces were ordered not to resist and the Lithuanian Air Force remained on the ground. At the time, the Lithuanian Armed Forces had 26,084 soldiers (of which 1,728 officers) and 2,031 civil servants. While the Lithuanian Riflemen's Union, subordinate to the army commander, had over 62,000 members of which about 70% were farmers and agricultural workers. After the occupation, the Soviets immediately took brutal action against the high-ranking officials of the state. Both targets of the ultimatum: the Minister of the Interior Kazys Skučas and the Director of the State Security Department of Lithuania Augustinas Povilaitis were transported to Moscow and later executed. Antanas Gustaitis, Kazys Bizauskas, Vytautas Petrulis, Kazimieras Jokantas, Jonas Masiliūnas, Antanas Tamošaitis also faced the fate of execution, while President Aleksandras Stulginskis, Juozas Urbšys, Leonas Bistras, Antanas Merkys, Pranas Dovydaitis, Petras Klimas, Donatas Malinauskas and thousands of others were deported. Stasys Raštikis, persuaded by his wife, secretly crossed the German border. After realizing this, NKVD started terror against the Raštikis family. His wife was separated from their 1-year-old daughter and brutally interrogated at Kaunas Prison, his old father Bernardas Raštikis, three daughters, two brothers and sister were deported to Siberia. Soldiers, officers, senior officers and generals of the Lithuanian Army and LRU members, who were seen as a threat to the occupiers, were quickly arrested, interrogated and released to the reserve, deported to the concentration camps or executed, trying to avoid this many joined the Lithuanian partisan forces. The army itself was initially renamed the Lithuanian People's Army; however, later it was reorganized into the 29th Rifle Corps of the Soviet Union. In June 1940, the Soviet Union occupied and annexed Lithuania in accordance with the Molotov–Ribbentrop Pact. Vladimir Dekanozov, a Soviet emissary from Moscow, gained effective power in Lithuania. Shortly afterwards, on June 17, 1940 the puppet People's Government of Lithuania was formed, which consistently destroyed Lithuanian society and political institutions and opened the way for the Communist Party to establish itself. In order to establish the legitimacy of the government and design the plans of Lithuania's "legal accession to the USSR", on July 1, the Seimas of Lithuania was dismissed and elections to the puppet People's Seimas were announced. The controlled (passports had imprints) and falsified elections to the People's Seimas were won by the Lithuanian Labour People's Union, who obeyed the occupiers' proposal to "ask" the Soviet authorities to have Lithuania admitted to the Soviet Union. After the occupation, the Lithuanian Diplomatic Service did not recognized the new occupants authority and started the diplomatic liberation campaign of Lithuania. In 1941, Kazys Škirpa, Leonas Prapuolenis, Juozas Ambrazevičius and their supporters, including the former Commander of the Lithuanian Army General Stasys Raštikis, whose whole family was deported to Siberia, began organizing an uprising. After realizing the reality of repressive and brutal Soviet rule, in the early morning of June 22, 1941 (the first day when the Nazi Germany attacked the Soviet Union) Lithuanians began the June Uprising, organized by the Lithuanian Activist Front, in Kaunas where its main forces were concentrated. The uprising soon expanded to Vilnius and other locations. Its main goal was not to fight with the Soviets, but to secure the city from inside (secure organizations, institutions, enterprises) and declare independence. By the evening of June 22, the Lithuanians controlled the Presidential Palace, post office, telephone and telegraph, and radio station. The control of Vilnius and most of the Lithuania's territory was also shortly taken over by the rebels. Multiple Red Army divisions stationed around Kaunas, including the brutal 1st Motor Rifle Division NKVD responsible for the June deportation, and the puppet Lithuanian SSR regime commanders were forced to flee into the Latvian SSR through the Daugava river. The commander of the Red Army's 188th Rifle Division colonel Piotr Ivanov reported to the 11th Army Staff that during the retreat of his division through Kaunas "local counterrevolutionaries from the shelters deliberately fired on the Red Army, the detachments suffering heavy losses of soldiers and military equipment". About 5,000 occupants were killed in Lithuania. On June 23, 1941 at 9:28 am Tautiška giesmė, the national anthem of Lithuania, was played on the radio in Kaunas. Many people listened to the Lithuanian national anthem with tears in their eyes. From Kaunas radio broadcasts, Lithuania learned that the rebellion was taking place in the country, the insurgents took Kaunas, the Proclamation of the Independence Restoration of Lithuania and the list of the Provisional Government was announced by Leonas Prapuolenis. The message was being repeated several times in different languages. The Provisional Government hoped that the Germans would re-establish Lithuanian independence or at least allow some degree of autonomy (similar to the Slovak Republic), was seeking the protection of its citizens and did not support the Nazis' Holocaust policy. The legitimate Lithuanian Minister of National Defence General Stasys Raštikis even met personally with the Nazi Germany Generals to discuss the situation. He approached the Kaunas War Field Commandant General Oswald Pohl and the Military Command Representative General Karl von Roques by trying to plead for him to spare the Jews, however they replied that the Gestapo is handling these issues and that they cannot help. Furthermore, in the beginning of the occupation, the Prime Minister of the Provisional Government of Lithuania Juozas Ambrazevičius convened the meeting in which the ministers participated together with the former President Kazys Grinius, Bishop Vincentas Brizgys and others. During the meeting, the Nazis were condemned for their actions against Jews and it was decided to help them. Although, they participants of the meeting understood that the help will be very limited, because already in the beginning of the Nazi occupation it was announced that the Jews are not under the competence of Lithuanian institutions. In the first issue of the daily Į laisvę (Towards Freedom) newspaper, the Independence Restoration Declaration was published, which had been previously announced on the radio. It stated that "The established Provisional Government of revived Lithuania declares the restoration of the Free and Independent State of Lithuania. The young Lithuanian state enthusiastically pledges to contribute to the organization of Europe on a new basis in front of the whole world innocent conscience. The Lithuanian Nation, exhausted from the terror of the brutal Bolshevism, decided to build its future on the basis of national unity and social justice." and signatures. On June 24, 1941, tank units of the Red Army in Jonava were ordered to retake Kaunas. The rebels radioed the Germans for assistance. The units were bombed by the Luftwaffe and did not reach the city. It was the first coordinated Lithuanian–German action. The first German scouts, lieutenant Flohret and four privates, entered Kaunas on June 24 and found it in friendly hands. A day later the main forces marched into the city without obstruction and almost as if they were on parade. On June 26, 1941 the German military command ordered the rebel groups to disband and disarm. Two days later Lithuanian guards and patrols were also relieved of their duties. Already in July, in a conversation the Tilsit Nazi Gestapo agent Dr Heinz Gräfe clearly stated to Stasys Raštikis that the Provisional Government was formed without German knowledge. Such a form, although not having anything against individuals, is unacceptable to the Germans. The current Provisional Government should be transformed into a National Committee or Council under the German military authority. The Nazi Germans did not recognize the new Provisional Government, but they did not take any action to dissolve it. The Provisional Government, not agreeing to become an instrument of the German occupiers,disbanded itself on August 5, 1941 after signing a protest for the Germans action of suspending the Lithuanian Government powers. Members of the Provisional Government then went as a body to the Garden of the Vytautas the Great War Museum, where they laid a wreath near the Tomb of the Unknown Soldier in the presence of numerous audience. The Sicherheitsdienst confiscated the pictures of the wreath-laying ceremony, thinking that it could be dangerous for the German occupation policy in Lithuania. On July 17, 1941 the German civil administration was established. The government's powers were taken over by the new occupants. Nazi Germany established the Reichskommissariat Ostland in the Baltic states and much of Belarus, and the administrative centre for Lithuania (Generalbezirk Litauen) was in Kaunas ruled by a Generalkommissar Adrian von Renteln. Jews began settling in Kaunas in the second half of the 17th century. They were not allowed to live in the city, so most of them stayed in the Vilijampolė settlement on the right bank of the Neris river. Jewish life in Kaunas was first disrupted when the Soviet Union occupied Lithuania in June 1940. The occupation was accompanied by arrests, confiscations, and the elimination of all free institutions. Jewish community organizations disappeared almost overnight. Soviet authorities confiscated the property of many Jews, while hundreds were exiled to Siberia. Right before the Second World War began, there were 30,000 Jews living in Kaunas, comprising about 25% of the city's population. When the Soviet Union took over Lithuania in 1940, some Jewish Dutch residents in Lithuania approached the Dutch consul Jan Zwartendijk to get a visa to the Dutch West Indies. Zwartendijk agreed to help them and Jews who had fled from German-occupied Poland also sought his assistance. In a few days, with the help of aides, Zwartendijk produced over 2,200 visas for Jews to Curaçao. Then refugees approached Chiune Sugihara, a Japanese consul, who gave them a transit visa through the USSR to Japan, against the disapproval of his government. This gave many refugees an opportunity to leave Lithuania for the Far East via the Trans-Siberian railway. The fleeing Jews were refugees from German-occupied Western Poland and Soviet-occupied Eastern Poland, as well as residents of Kaunas and other Lithuania territories. The Sugihara House, where he was previously issuing transit visas, currently is a museum and the Centre For Asian Studies of Vytautas Magnus University. Following Hitler's invasion of the Soviet Union on 22 June 1941, Soviet forces fled from Kaunas. Both before and after the German occupation on 25 June, the anti-Communists began to attack Jews, blaming them for the Soviet repressions, especially along Jurbarko and Kriščiukaičio streets. Nazi authorities took advantage of the Lithuanian TDA Battalions and established a concentration camp at the Seventh Fort, one of the city's ten historic forts, and 4,000 Jews were rounded up and murdered there. The Kaunas pogrom was a massacre of Jewish people living in Kaunas, Lithuania that took place on June 25–29, 1941—the first days of the Operation Barbarossa and of Nazi occupation of Lithuania. Prior to the construction of the Ninth Fort museum on the site, archaeologists unearthed a mass grave and personal belongings of the Jewish victims. At times Lithuanian Jews were murdered in their homes with unprecedented brutality—slowly sawing off heads or sawing people in two. The Ninth Fortress has been renovated into a memorial for the wars and is the site where nearly 50,000 Lithuanians were killed during Nazi occupation. Of these deaths, over 30,000 were Jews. Beginning in 1944, the Red Army began offensives that eventually led to the reconquest of all three of the Baltic states. Kaunas again became the major centre of resistance against the Soviet regime. From the very start of the Lithuanian partisans war, the most important partisan districts were based around Kaunas. Although guerrilla warfare ended by 1953, Lithuanian opposition to Soviet rule did not. In 1956 people in the Kaunas region supported the uprising in Hungary by rioting. On All Souls' Day in 1956, the first public anti-Soviet protest rally took place in Kaunas: citizens burned candles in the Kaunas military cemetery and sang national songs, resulting in clashes with the Militsiya. On 14 May 1972, 19-year-old Romas Kalanta, having proclaimed "Freedom for Lithuania! ", immolated himself in the garden of the Musical Theatre, after making a speech denouncing the Soviet suppression of national and religious rights. The event broke into a politically charged riot, which was forcibly dispersed by the KGB and Militsiya. It led to new forms of resistance: passive resistance all around Lithuania. The continuous oppression of the Catholic Church and its resistance caused the appearance of the Chronicle of the Catholic Church in Lithuania. In strict conspiracy, Catholic priest Sigitas Tamkevičius (now the Archbishop Metropolitan of Kaunas) implemented this idea and its first issue was published in the Alytus district on 19 March 1972. The Kronika started a new phase of resistance in the life of Lithuania's Catholic Church and of all Lithuania fighting against the occupation by making known to the world the violation of the human rights and freedoms in Lithuania for almost two decades. On 1 November 1987, a non-sanctioned rally took place near the Kaunas Cathedral Basilica, where people gathered to mark famous Lithuanian poet Maironis' 125th-birthday anniversary. On 10 June 1988, the initiating group of the Kaunas movement of Sąjūdis was formed. On 9 October 1988, the Flag of Lithuania was raised above the tower of the Military Museum. Kaunas, along with Vilnius, became the scene of nearly constant demonstrations as the Lithuanians, embarked on a process of self-discovery. The bodies of Lithuanians who died in Siberian exile were brought back to their homeland for reburial, and the anniversaries of deportations as well as the important dates in Lithuanian history began to be noted with speeches and demonstrations. On 16 February 1989 Cardinal Vincentas Sladkevičius, for the first time, called for the independence of Lithuania in his sermon at the Kaunas Cathedral. After the services, 200,000 persons gathered in the centre of Kaunas to participate in the dedication of a new monument to freedom to replace the monument that had been torn down by the Soviet authorities after World War II. After World War II Kaunas became the main industrial city of Lithuania—it produced about a quarter of Lithuania's industrial output. After the proclamation of Lithuanian independence in 1990, Soviet attempts to suppress the rebellion focused on the Sitkūnai Radio Station. They were defended by the citizenry of Kaunas. Pope John Paul II said Holy Mass for the faithful of the Archdiocese of Kaunas at the Kaunas Cathedral Basilica and held a meeting with the young people of Lithuania at the S. Darius and S. Girėnas Stadium, during his visit to Lithuania in 1993. Kaunas natives Vytautas Landsbergis and Valdas Adamkus became the Head of state in 1990, and, respectively, in 1998 and 2004. Since the restoration of independence, improving substantially air and land transport links with Western Europe have made Kaunas easily accessible to foreign tourists. Kaunas is famous for its legendary basketball club Žalgiris, which was founded in 1944 and was one of the most popular nonviolent expressions of resistance during its struggle with the CSKA Moscow. In 2011, the largest indoor arena in the Baltic states was built and was named Žalgiris Arena. Kaunas hosted finals of the widely appreciated EuroBasket 2011. In March 2015 Kaunas interwar buildings has received a solid award—European Heritage Label. On 10 January 2017 Kaunas interwar modern architecture was included in the UNESCO World Heritage Site Tentative List. On 29 March 2017 Kaunas was named European Capital of Culture of 2022. On 28 September 2017 the winner of the M. K. Čiurlionis Concert Centre architectural competition was announced and the centre is planned to be completed by 2022, close to the Vytautas the Great Bridge. Despite its northern location, the climate in Kaunas is relatively mild compared to other locations at similar latitudes, mainly because of the Baltic Sea. Because of its latitude, daylight in Kaunas extends 17 hours in midsummer, to only around 7 hours in midwinter. The Kazlų Rūda Forest, west of Kaunas, create a microclimate around the city, regulating humidity and temperature of the air, and protecting it from strong westerly winds. Kaunas city is a centered around culture. The Old Town of Kaunas is located at the confluence of the Nemunas and Neris Rivers where old architectural monuments and other historical buildings are located. Located to the East of the Old Town is the city's New Town, which started developing in 1847 and got its name when it became a distinct part of the city. Central Kaunas is defined by two pedestrian streets: the 2-km-long Laisvės alėja (Liberty Avenue), a central street of the city, lined by linden trees and decorated with flower beds. On 23 September 2018, Pope Francis visited Kaunas' Santakos Park as part of a tour of the Baltic states. Primary foreign investors in Kaunas are companies from the Sweden, United States, Finland, Estonia, Denmark, and Russia. Head offices of several major International and Lithuanian companies are located in Kaunas, including "Kraft Foods Lietuva", largest Generic Pharmaceuticals producer in Lithuania "Sanitas", producer of sportswear AB "Audimas", one of the largest construction companies "YIT Kausta", JSC "Senukai", largest producer in Lithuania of strong alcoholic drinks JSC "Stumbras", Finnish capital brewery JSC "Ragutis", JSC "Fazer Gardesis", JSC "Stora Enso Packaging", producer of pharmaceuticals, and the only producer of homoeopathic medicines in Lithuania JSC "Aconitum". Due to its geographic location, Kaunas is considered one of the biggest logistics centres in Lithuania. The largest wholesale, distribution and logistics company in Lithuania and Latvia JSC "Sanitex", as well as a subsidiary of material handling and logistics company Dematic in the Baltics have been operated in Kaunas. Currently, Kaunas Public Logistics Centre is being built by the demand of national state-owned railway company Lithuanian Railways. The "Margasmiltė" company currently has been working on a project that concerns exploitation of Pagiriai anhydrite deposit. The project includes mining of anhydrite, a mine with underground warehouses, building the overground transport terminal, as well as an administrative building. The Pagiriai anhydrite deposit is located 10.5 km (6.5 mi) south from the downtown of Kaunas, at a 2.2 km (1.4 mi) distance to the southwest from the Garliava town. The resources of thoroughly explored anhydrite in the Pagiriai deposit amount to 81.5 million tons. The Lithuanian Central Credit Union—national cooperative federation for credit unions established in 2001, is located in Kaunas. At present the Lithuanian Central Credit Union has 61 members. Some notable changes are under construction and in the stage of disputes. The construction of a new landmark of Kaunas—the Žalgiris Arena—began in the autumn of 2008. It was completed in August 2011. Currently discussions are underway about the further development of the Vilijampolė district on the right bank of the Neris river and the Nemunas River, near their confluence. In October 2017, a automotive parts and technologies manufacturer Continental AG decided to invest over 95 million Euro to build a new factory in Kaunas, which is the largest direct investment from a foreign country. Kaunas Mosque is the only brick mosque in Lithuania. To this day, it is still used by the Lipka Tatars, who were settled in the country by Vytautas the Great during the Middle Ages. The Neviazh Kloyz is one of the remaining former synagogues, located in the Kaunas Old Town. The complex was built in the 19th century and also served as a community house and school. Kaunas city municipality council is the governing body of the Kaunas city municipality. It is responsible for municipality laws. The council is composed of 41 members (40 councillors and a mayor) all directly elected for four-year terms. Kaunas International Airport (KUN) is the second-busiest airport in Lithuania and fourth-busiest airport in the Baltic states. In 2016, it handled 740,448 passengers (in addition to 2,488 tons of cargo), down from the peak of 872,618 passengers in 2011. An Irish low-cost airline Ryanair announced Kaunas Airport as their 40th base and first in the Central Europe in February 2010. The smaller S. Darius and S. Girėnas Airport, established in 1915, is located about three kilometres (1.9 mi) south of the city centre. It is one of the oldest still functioning airports in Europe used for tourism and air sports purposes and now hosts the Lithuanian Aviation Museum. Kaunas is an important railway hub in Lithuania. First railway connection passing through Kaunas was constructed in 1859–1861 and opened in 1862. It consisted of Kaunas Railway Tunnel and the Railway Bridge across the Nemunas river. Kaunas Railway Station is an important hub serving direct passenger connections to Vilnius and Warsaw as well as being a transit point of Pan-European corridors I and IX. Some trains run from Vilnius to Šeštokai, and, Poland, through Kaunas. International route connecting Kaliningrad, Russia and Kharkiv, Ukraine, also crosses Kaunas. The first phase of the Standard gauge Rail Baltica railway section from Šeštokai to Kaunas was completed in 2015. The public transportation system is managed by Kauno viešasis transportas (KVT). There are 14 trolleybus routes, 43 bus routes. In 2007 new electronic monthly tickets began to be introduced for public transport in Kaunas. The monthly E-ticket cards may be bought once and might be credited with an appropriate amount of money in various ways including the Internet. Previous paper monthly tickets were in use until August 2009. Kaunas is also one of the major river ports in the Baltic States and has two piers designated for tourism purposes and located on the banks of Nemunas river and Kaunas Reservoir—the largest Lithuanian artificial lake, created in 1959 by damming the Nemunas near Kaunas and Rumšiškės. In 2015, Kauno autobusai bought four Van Hool AGG300 to serve the mostly populated 37th route. These are the longest buses used in the Baltic states. The bus station in Kaunas underwent reconstruction for six months and reopened January 23, 2017. It is the biggest and most modern bus station in Lithuania. Kauno autobusai is planning to cardinally upgrade the trolleybuses and buses park till the end of 2019. Sports in Kaunas have a long and distinguished history. The city is home to a few historic clubs such as: LFLS Kaunas football club (est. 1920), LFLS Kaunas baseball club (est. 1922), Žalgiris basketball club (est. 1944). Ice hockey was first played in Lithuania in 1922. The first Lithuanian ice hockey championship composed of four teams (LFLS, KSK, Kovas, and Macabi) was held in Kaunas, in 1926. Kaunas is home to some historic venues such as: the main stadium of the city—S.Dariaus ir S.Girėno Sporto Centras (total capacity 9,000), which is also the Lithuanian soccer club FBK Kaunas's and Lithuanian national football team home stadium established in 1923, and Kaunas Sports Hall, completed in 1939 for the Third European Basketball Championship. S.Dariaus and S.Girėno Stadium is also used as the only large athletics stadium in Lithuania. In July 1938 Kaunas, together with Klaipėda (where sailing and rowing competitions were held), hosted the Lithuanian National Olympiad that gathered the Lithuanian athletes from all around the world. The university status Lithuanian Academy of Physical Education, founded during the Interwar period, is the only state-supported institution of tertiary physical education in Lithuania. The National Football Academy—the national centre for the training of the best Lithuanian young players of football was established in Kaunas in 2006. Žalgiris basketball club, one of Europe's strongest basketball clubs, now plays in the EuroLeague. Kaunas has also hosted the knockout stage of the European Basketball Championship of 2011. The largest indoor Žalgiris Arena in the Baltics has been completed in Kaunas for the event. The arena is used to host sports games as well as concerts. The city is also the birthplace or childhood home of many of the country's top basketball stars, among them Arvydas Sabonis, Šarūnas Marčiulionis, Zydrunas Ilgauskas, Linas Kleiza, Donatas Motiejūnas and Šarūnas Jasikevičius. The first golf club "Elnias" in Lithuania was opened in Kaunas in 2000. Nemuno žiedas is the only in Lithuania motor racing circuit, situated in Kačerginė, a small town near Kaunas. A yacht club operates in the Kaunas Reservoir Regional Park. ^ a b c "Kodėl Kaunas buvo vadinamas mažuoju Paryžiumi?". lrytas.lt (in Lithuanian). Retrieved 3 January 2013. ^ a b Raffa, Guy P. (2009). The Complete Danteworlds: A Reader's Guide to the Divine Comedy. University of Chicago Press. ISBN 978-0226702872. ^ "Kaunas city municipality – Mayor's office". Kaunas city municipality. Retrieved 2018-06-07. ^ Bryant, Jon (8 September 2016). "10 of the best European cities for art deco design". The Guardian. Retrieved 8 September 2016. ^ "ART DECO KAUNAS". ArtDecoKaunas.lt. Retrieved 4 November 2017. ^ "Kaunas – Cities of Design Network". DesignCities.net. Retrieved 4 November 2017. ^ "Kaunas European Capital of Culture 2022". Kaunas2022.eu. 21 January 2016. Archived from the original on 8 December 2017. Retrieved 7 December 2017. ^ Zinkevičius, Zigmas (2007). Senosios Lietuvos valstybės vardynas. Vilnius: Mokslo ir enciklopedijų leidybos institutas. p. 42. ISBN 5-420-01606-0. ^ Ivinskis, Zenonas (1953–1966). "Palemonas". Lietuvių enciklopedija. 21. Boston: Lietuvių enciklopedijos leidykla. pp. 400–401. LCC 55020366. ^ "Palemonas.info; Kauno mikrorajonas – Palemonas" (in Lithuanian). Archived from the original on 24 August 2011. Retrieved 13 April 2011. ^ "Kaunas: Dates and Facts. Overview of Kaunas History". Retrieved 13 October 2016. ^ a b c d "Kaunas: Dates and Facts. Overview of Kaunas History". Retrieved 29 October 2010. ^ Simas Sužiedėlis, ed. (1970–1978). "Vaidotas". Encyclopedia Lituanica. VI. Boston: Juozas Kapočius. p. 21. LCC 74-114275. ^ Places to Visit: "Kaunas Castle", Kaunas City Municipality. ^ Laužikas, Rimvydas (15 October 2004). "Trakų vaivadija". Aruodai (in Lithuanian). Lithuanian Institute of History. Retrieved 22 April 2011. ^ "L.Karalius: "Europos pirkliai puikiai žinojo Kauną LDK laikais"". LZinios.lt. Retrieved 29 January 2014. ^ Mills, Jennifer (May 1998). 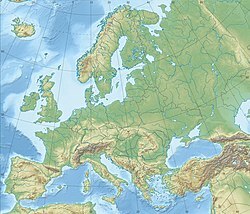 "The Hanseatic League in the Eastern Baltic". Encyclopedia of Baltic History (group research project) . University of Washington. Archived from the original on 29 June 2011. ^ a b c http://datos.kvb.lt/en/index.php?option=com_content&task=view&id=21&Itemid=81 Kaunas: Dates and Facts. Overview of Kaunas History. ^ Kaunas History. Retrieved on 12 April 2011. ^ "Archived copy". Archived from the original on 3 February 2011. Retrieved 20 March 2011. CS1 maint: Archived copy as title (link) AB Lietuvos Energija. Development of Lithuanian Energy Sector. ^ "Žemaičių vyskupystės istorinis ir dailės palikimas". www.limis.lt (in Lithuanian). Retrieved 2 November 2017. ^ "Kauno kunigų seminarija – katalikybės ir lietuvybės židinys". www.xxiamzius.lt. Retrieved 26 October 2017. ^ Eidintas, Alfonsas; Vytautas Žalys; Alfred Erich Senn (1999). Ed. Edvardas Tuskenis, ed. Lithuania in European Politics: The Years of the First Republic, 1918–1940 (Paperback ed.). New York: St. Martin's Press. pp. 67–70. ISBN 0-312-22458-3. ^ Senn, Alfred Erich (2007). Lithuania 1940: Revolution from Above. On the Boundary of Two Worlds: Identity, Freedom, and Moral Imagination in the Baltics. Rodopi. p. 10. ISBN 90-420-2225-6. ^ Aras, Lukšas. "Nevykę "vilkų" žaidimai". LZinios.lt. Retrieved 16 August 2013. ^ Lapinskas, Anatolijus. "Lietuva tarpukariu nebuvo atsilikėlė". DELFI. Retrieved 29 September 2013. ^ Dobkevičius, Kazimieras (6 February 2002). "Klojęs Lietuvos valstybės pamatus". XXI amžius (newspaper) (in Lithuanian) (10 (1017)). Retrieved 20 July 2011. ^ "KARO MOKYKLOS KŪRIMASIS 1919 M." Partizanai.org (in Lithuanian). Retrieved 27 November 2017. ^ "Šarvuota Lietuva: kiek iš tikro mūsų kariuomenė turėjo tankų? :: Istorija ir archeologija :: www.technologijos.lt". www.technologijos.lt (in Lithuanian). Retrieved 21 February 2017. ^ "Paskutinįjį Lietuvos karo aviacijos viršininką prisimenant". www.xxiamzius.lt. Retrieved 27 November 2017. ^ a b c d "Kovno". Ushmm.org. Retrieved 5 May 2009. ^ a b Starinskas, Kęstutis. "Lemtingi metai generolo Raštikio dienoraščiuose". LZinios.lt. Retrieved 16 September 2006. ^ a b c d "Kuo reikšmingas 1941 m. birželio 22–28 d. sukilimas?". LLKS.lt. Retrieved 20 June 2014. ^ Brandišauskas, Valentinas (2002). "1941 m. sukilimas ir nepriklausomybės viltys". Gimtoji istorija. Nuo 7 iki 12 klasės (in Lithuanian). Vilnius: Elektroninės leidybos namai. ISBN 9986-9216-9-4. Archived from the original on 2008-03-03. Retrieved 2009-07-04. ^ Gerutis, Albertas, ed. (1984). Lithuania: 700 Years. translated by Algirdas Budreckis (6th ed.). New York: Manyland Books. pp. 325–326. ISBN 0-87141-028-1. LCC 75-80057. ^ Bubnys, Arūnas (1998). Vokiečių okupuota Lietuva (1941–1944) (in Lithuanian). Vilnius: Lietuvos tautinis kultūros fondas. p. 40. ISBN 9986-757-12-6. ^ Misiunas, Romuald J.; Rein Taagepera (1993). The Baltic States: Years of Dependence 1940–1990 (expanded ed.). University of California Press. p. 47. ISBN 0-520-08228-1. ^ Bubnys, Arūnas (1998). Vokiečių okupuota Lietuva (1941–1944) (in Lithuanian). Vilnius: Lietuvos tautinis kultūros fondas. p. 38. ISBN 9986-757-12-6. ^ Škirpa, Kazys (1973). Sukilimas Lietuvos suverenumui atstatyti. New York: Franciscan Fathers Press. p. 502. ^ Kay, Alex J. (2006) Exploitation, Resettlement, Mass Murder: Political and Economic Planning for German Occupation Policy in the Soviet Union, 1940–1941, p. 129. Berghahn Books. ^ "The Jewish Community of Kaunas". The Museum of the Jewish People at Beit Hatfutsot. Retrieved 1 July 2018. ^ Paldiel, Mordecai (2000). Saving the Jews: Amazing Stories of Men and Women Who Defied the "Final Solution. Schreiber. pp. 75–77. ISBN 1887563555. ^ Pulvers, Roger (11 July 2015). "Chiune Sugihara: man of conscience". The Japan Times. Retrieved 11 July 2015. ^ Kaleem, Jaweed (24 January 2013). "Chiune Sugihara, Japan Diplomat Who Saved 6,000 Jews During Holocaust, Remembered". Huffington Post. Retrieved 24 January 2013. ^ "Sugihara House". www.sugiharahouse.com. Retrieved 8 December 2017. ^ "Centre For Asian Studies | ASC, Asian Studies, VMU, Lithuania, Kaunas". asc.vdu.lt. Retrieved 9 December 2017. ^ "Stasys Knezys. Kauno karo komendantūros Tautinio darbo batalionas 1941 m." genocid.lt. Retrieved 30 January 2004. ^ "Lithuanians – History and Cultural Relations". Retrieved 29 October 2010. ^ Vardys, Stanley (Summer 1972). "Protests in Lithuania not Isolated". Lituanus. Retrieved 29 January 2011. ^ "The Chronicle of the Catholic Church in Lithuania. Situation of the Catholic Church in Lithuania in Soviet times". Archived from the original on 9 May 2010. Retrieved 10 November 2010. ^ Satter, David (Summer 2009). "From a Journalist's Notebook: Vilnius, January 13, 1991". Lituanus. Retrieved 29 January 2011. ^ "Seimas of the Republic of Lithuania. A Chronicle of the Events of January 1991 and Later Months, which were a critical part of the remaining free media". Retrieved 29 January 2011. ^ "Archived copy". Archived from the original on 22 July 2011. Retrieved 10 November 2009. CS1 maint: Archived copy as title (link) Kaunas. Facts&History. ^ "The Holy See: Apostolic journey to Lithuania, Latvia and Estonia (4–10 September 1993)". Holy See. Retrieved 30 October 2009. ^ "Kaunas of 1919–1940, Lithuania – Creative Europe – European Commission". EC.Europa.eu. Retrieved 25 October 2017. ^ "Kaunas Was Awarded a European Heritage Label". visit.kaunas.lt. Retrieved 8 November 2017. ^ "UNESCO pripažinimo besiekiant: 10 vertingiausių Kauno modernizmo architektūros perliukų". 15min.lt. Retrieved 11 February 2017. ^ "Kaunas 1919-1939: The Capital Inspired by the Modern Movement". UNESCO.org. Retrieved 27 October 2017. ^ "Kaunas paskelbtas 2022-ųjų Europos kultūros sostine". DELFI.lt. Retrieved 29 March 2017. ^ "Paaiškėjo Kauno M.K. Čiurlionio koncertų centro vaizdas: architektūrinį konkursą laimėjo vilniečiai". 15min.lt. Retrieved 28 September 2017. ^ "ĄŽUOLYNO PARKAS". visit.kaunas.lt (in Lithuanian). Retrieved 8 November 2017. ^ "Baltic University Programme Urban Forum City Status Report V". Baltic University Programme. Archived from the original on 10 June 2007. Retrieved 25 January 2009. ^ "Portrait of the Regions of Lithuania; Kazlų Rūda Municipality". Retrieved 6 December 2010. ^ "World Weather Information Service – Kaunas". World Meteorological Organization. May 2011. Retrieved 1 December 2008. ^ "Kaunas Climate Normals 1961–1990". National Oceanic and Atmospheric Administration. Retrieved 2 February 2013. ^ "Climatological Normals of Kaunas". Hong Kong Observatory. Retrieved 14 March 2011. ^ "Météo Climat stats for Kaunas 1981–2010". Météo Climat. Retrieved 15 October 2017. ^ Semaska, Algimantas (2013). Lithuania: A State at the Centre of Europe. Vilnius: Algimantas. pp. 65–76. ISBN 978-609-423-011-0. ^ Underground Printing-House "ab" The Branch Museum of Vytautas the Great War Museum Retrieved on 29 April 2011. ^ "Archived copy". Archived from the original on 10 August 2011. Retrieved 29 April 2011. CS1 maint: Archived copy as title (link) The Registry of Immovable Cultural Heritage Sites: Unique object code: 24807. Retrieved on 29 April 2011. ^ Museums in Kaunas Retrieved on 9 June 2011. ^ "Aplinkos apsauga. Kauno miesto savivaldybė; Kauno miesto želdynų sistemos formavimas" (in Lithuanian). Archived from the original on 22 July 2011. Retrieved 11 December 2010. ^ "Santakos Park in Kaunas, Lithuania, Secured by TLC Fencing During Pope Francis' Visit". Retrieved 25 October 2018. ^ Kaunas County Governor's Administration Archived 22 March 2012 at the Wayback Machine Retrieved on 8 April 2011. ^ European Business Guide. Kaunas Archived 6 January 2012 at the Wayback Machine Retrieved on 8 December 2011. ^ Stora Enso.Kaunas Mill Archived 3 October 2011 at the Wayback Machine Retrieved on 3 September 2011. ^ Pharmaceutical company "Aconitum" Archived 9 November 2011 at the Wayback Machine Retrieved on 3 September 2011. ^ JSC "Margasmiltė". Anhydrite mining Archived 26 April 2012 at the Wayback Machine Retrieved on 7 December 2011. ^ Lithuanian Central Credit Union Archived 11 December 2011 at the Wayback Machine Retrieved on 7 December 2011. ^ Koreans open LED lighting assembly plant in Kaunas. Retrieved on 16 March 2011. ^ Baltic Car Equipment. Retrieved on 12 March 2012. ^ Kaunas Free Economic Zone Home page. Retrieved on 25 October 2010. ^ Fortum Heat Lithuania is planning to build a power plant in Kaunas Archived 14 September 2012 at the Wayback Machine Retrieved on 12 March 2012. ^ "Home page". Air Lithuania. 6 August 2002. Archived from the original on 6 August 2002. Retrieved 15 January 2010. ^ "Kamanė; Blessing to Open Kaunas Arena Facades". Archived from the original on 27 July 2011. Retrieved 17 May 2010. ^ ""Continental" statys gamyklą Kaune: ruošia 1 tūkst. darbo vietų". DELFI. Retrieved 30 October 2017. ^ "Kauno totoriai". www.totoriai.lt. Retrieved 26 October 2017. ^ "Žydai Lietuvoje | Kaunas". www.zydai.lt. Retrieved 5 April 2007. ^ "2007 m. Europos žydų kultūros dienos atgarsiai". www.heritage.lt. Archived from the original on 15 February 2008. Retrieved 2 September 2007. ^  Archived 22 July 2011 at the Wayback Machine History of Lithuanian Railways. Construction of First Railways. Retrieved on 7 April 2011. ^ "Kauno viešasis transportas (KVT)". KVT. Archived from the original on 2 March 2011. Retrieved 6 March 2011. ^ "Schedules: Buses". Kauno viešasis transportas (KVT). Retrieved 6 March 2011. ^ "Menas valdyti energiją" (PDF) (in Lithuanian). Lietuvos Energija. Archived from the original (PDF) on 21 February 2011. Retrieved 19 May 2011. ^ Stasaityte, Vytene (January 2017). "Verslo žinios". Verslo žinios. ^ ""Kauno autobusai" ruošiasi kardinaliam transporto priemonių parko atnaujinimui". Kas vyksta Kaune (in Lithuanian). Retrieved 29 August 2017. ^ "Elektrėnų sporto, turizmo ir pramogų centras; Ledo ritulys" (in Lithuanian). Archived from the original on 14 August 2010. Retrieved 25 October 2010. ^ "Lietuvos tautinė olimpiada ir Pasaulio lietuvių sporto žaidynės". Lietuvos olimpinis muziejus (in Lithuanian). 10 June 2016. Retrieved 8 December 2017. ^ "Hospital of Lithuanian University of Health Sciences Kauno Klinikos | LSMU". www.lsmuni.lt. Retrieved 26 October 2017. ^ Martynas Mažvydas National Library of Lithuania. Historical Outlines Archived 2 March 2012 at the Wayback Machine Retrieved on 30 December 2011. ^ Kaunas County Public Library Retrieved on 9 December 2011. ^ "History". www.Kaunasjazz.lt. Retrieved 26 October 2017. ^ "Pažaislio muzikos festivalis – XXII". Pazaislis.lt (in Lithuanian). Retrieved 26 October 2017. ^ "KAUNAS PHOTO – festival in Lithuania, since 2004". festival.Kaunasphoto.com. Retrieved 26 October 2017. ^ "About festival". DanceFestival.lt. 5 September 2015. Retrieved 26 October 2017. ^ "Kauno partneriai". Archived from the original on 24 July 2014. Retrieved 27 October 2015. ^ "City of Brno Foreign Relations – Statutory city of Brno" (in Czech). 2003. Archived from the original on 15 January 2016. Retrieved 6 September 2011. (in English, German, French and Polish) 2007 Wrocław Municipality. Retrieved 23 October 2008. ^ "JPL Small-Body Database Browser". NASA. Retrieved 7 December 2010. Wikisource has the text of the 1911 Encyclopædia Britannica article Kovno (town).